How to match strobe and ambient color temp using the K3? I am doing a project where I shoot shopkeeper portraits in their stores. The idea is to catch a large part of the interiors in these photos and there are lots of different lights there. I want to use a fairly small aperture to get decent depth of field, so extra light is needed for fill. How can I use the K3 manual whitebalance metering to actually find the right gel combination so that my flashes best matches the ambient color? On the K-7 and K-5 there is no direct method. I take a custom white balance and a test shot using an expodisc (filling the frame with a gray card would work too) under each light source with each white balance. You can then look at the individual RGB curves of each test shot on the camera. This will let you see how much additional R, G or B is present under each light source. Add gels and take more test shot until you get the RGB curves balanced for the strobes using the white balance of the ambient lighting. Do you have an iPhone? You can get a Luxi for $30 - it's a little plastic dome that clips onto the front-facing camera of the phone and turns it into an incident light and color temperature meter. Or you can get a real dedicated incident light meter for a lot more money and a little bit better accuracy. Luxi seems like a low cost intro to Light metering. I am on Android and Extrasensory devices web says they launched an Android version which is great. However I can only find info on light metering - is it really also a color temperature meter? See screenshot. This is using the LightMeter app, i don't have the luxi app installed since I already had this one. It's also using a Kleenex instead of a luxi, since that's what I had handy. Oh, nice. They came out with a less stupid version. The original only worked on iPhones with no cases, which is dumb - it's just a piece of plastic that you stick on your front facing camera. Now they have one that clips on any device up to a half inch thick, so it will work with cases, tablets, android phones, etc. assuming there's an app that can make use of it anyway. "Does Luxi work with flashes? Unfortunately not. 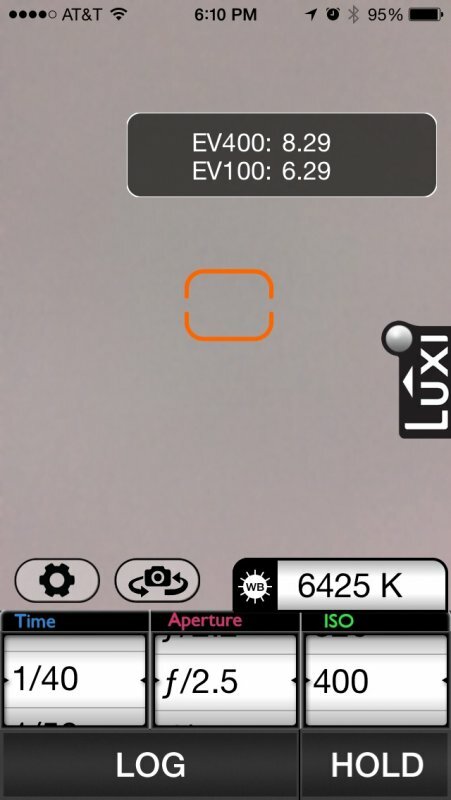 While Luxi itself has no limitations on this, light meter apps are unable to detect light coming from flashes due to smartphone / tablet hardware limitations." Sorry, maybe I misunderstood. Why would you need it to trigger from the flash? You want to know the ambient light temperature, so you know what color to gel your flash with so it's a decent match for the overall ambient temperature, right? I suppose if it could capture flash you'd be able to verify you got it right, but since you're shooting digital, I'd expect a glance at the photo would tell you that. Of course you are right, why over complicate things? The gel color temperature is marked on each gel and the Rouge kit I have also states temperatures for some gel combinations - that could actually work. Hm, I downloaded the Luxi app for Android and there is no color temp reading, just the EV and Lux. But looking around in the Google Play store for color measuring apps I found this super simple app "Color Temp Meter" for just a dollar, working just with the Smartphone camera naked, without a Luxi dome. Probably not very accurate, but a first test with daylight, incandescent and fluorescent lightsources seems to be pretty OK. The question is why can not my much more advanced K-3 camera do this? Last edited by marmitse; 02-18-2015 at 01:50 AM. K-3 and Manual White Balance (menu). There is in K-3 menu a method for whitecard (or a piece of white stuff, whatever you call white, i.e. your bride ). Greycard should also work I guess. I'd like to test that menu way with 'white cap', which may mean commercial white cap to be put on the lens, or just camera body white cap (is that truly white?). You simply go to the White Balance -> Manual White Balance -> "1", "2" or "3", you aim at your white card/white stuff and press the shutter, then after you press "OK" you just programmed your "1", "2" or "3" manual white balance in the camera. I guess you may experiment with Manual WB and your gels. Did you check if K-3 Exif shows adjustment done by Auto WB mode? Actually, what means Exif data WhitePoint (i.e. : 18528 8192 8192 12896), and could that data be helpful in any way? What actually Manual WB means in terms of the colour curve shape? The same question (concerning colour curve shape) is for K-3 Multi Auto WB menu function. The curve shape is important for fluorescents (fluorescents have two-three or more 'colour peaks') or for mixed-source lights. Let's say we mix low-temperature (i.e. incandescent / halogen bulb) light with high-temperature (ie. flash or true daylight) light-source on one picture. How K-3 Multi AWB / AWB algorithms handle the above? Does K-3 simply 'average' the colour temperature curve as to have just one 'peak', or they ingeniously create 'two peaks' colour curve to adjust your art? Without some kind of diffuser like the dome, you're probably picking up one specific light source more than another, but hey, it's better than nothing I guess. As for your K3 -- It's doing exactly the same thing your phone is doing when you're using it that way, and probably doing a better job of it. It's looking at the light that's reflected off the subject and its surroundings, assuming that the whole scene averages out to 18% grey, and most of the time, that's a pretty decent and usable thing. What your K3 can't do is sit facing your K3 from across the room and tell you what the ambient light falling on the subjects is like, and get good results in places where it doesn't come out to 18% grey. A snowy day with a bright blue sky - it'll meter to grey. A closeup of a bride in a white gown? grey. A closeup of a groom in a black tuxedo without much shirt exposed? Grey. An incident meter tells you how much light is actually there, not a guess based on what it assumes the average scene should look like. Of course, it's probably a lot easier to just get it approximately right using EV adjustments in the camera and then tweak it in post. Right, thanks narual for clarifications. I understand that the K-3 averages the reflected light into the sensor and that a dome would enable an incident light measurement (I guess there are domes also for DSLR lenses). Either way it would be nice to be able to have the color temperature reading (of reflected or incident light) in deg Kelvin directly in the camera, so that I can decide on the corresponding strobe gel. The best camera practice I have found for now is to make a test shot (of the reflected scene) and to manually set the white balance temperature (in WB menu K1, K2 or K3) so that the camera LCD picture resembles the scene I see with my eyes. In this way I get an estimated color temperature (I guess like Prakticant writes above), but there should be a more precise way I think. And yes tweaking WB in post is OK, but problem arises if there are multiple light sources with different temperatures. Just trying to avoid that.